To support our Winter Appeal a few of our supporters kicked off the winter with a few fundraising initiatives. Hopefully be sharing some of these stories and other ideas we can inspire a few more people to do some fundraising for the appeal. First we had a fundraising dinner party in Switzerland. 12 guests were invited round for a culinary mix evening – American Thanksgiving and Swiss Raclette – and each was asked to bring a minimum donation of 10CHF (and a bottle of wine for good measure). For those who do not know what a Raclette is – it is essentially melted Swiss cheese which you can then melt onto, or add to, various other things such as potatoes, or in this case Turkey and cranberries. The event was a huge success. The evening was highly enjoyable and the Swiss American mix worked remarkably well! But most importantly 300CHF was raised by this event thanks to people’s generosity. 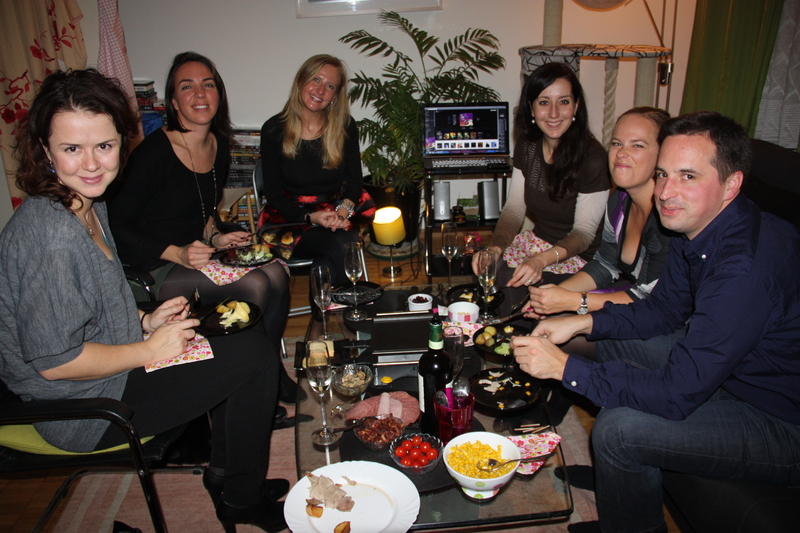 The next fundraising event was a “virtual party” organised by our founder Aniela for her birthday. Using Facebook Aniela set up an event for her birthday. Launched a week before the birthday itself, Aniela used the event to bring supporters together and specifically asked for donations to the charity instead of gifts. Each day there were updates and reminders for the Chip-in set up for the event. Then, when the big day came, everyone joined the “virtual party” with chat, sharing photos and of course donations being made. The end result was $1350 or nearly €1000! A huge success using nothing more than the event function in Facebook! This money has already been spent to pay off debts with the local vets and any remainder will be used to buy food for the shelter dogs. This means we are now starting the winter with smaller debts at the vets which means we can continue to get emergency vet care and vaccinations as the winter progresses. Some of the physical treats sent to Aniela also went to good use for the rescue kittens, who instantly fell in love with their play tunnel, and treats were shared with a few of the stray street dogs – who had probably never had a real dog treat in their lives. Both of these events were very simple and cheap to set up and run but will have a huge impact for the animals that Hope for Romanian Strays helps look after. Why not consider doing a fund raiser yourself? This time of year is great for organising festive drinks and events – why not ask participants to chip-in and ask for small donations to help us buy more food for the winter? Or how about doing a reverse Advents Calendar? Each day put £1, $1 or 1€ aside? 25£/$/€ may not seem much to you but to us that would cover the cost of getting a female dog neutered or buy food and vaccines for some of the abandoned puppies. €25 to us means a great deal and if each supporter donated this over the next month we could do so much more.